The Karakoram is situated in the disputed state of Jammu and Kashmir. It has more than sixty peaks above 7,000 मी (23,000 फीट), including K2, the second highest peak in the world 8,611 मी (28,251 फीट). K2 is just 237 मी (778 फीट) smaller than the 8,848 मी (29,029 फीट) Mount Everest. The range is about 500 किमी (310 मील) in length and the most heavily glaciated part of the world outside of the polar regions. The Siachen Glacier at 76 किमी (47 मील) and the Biafo Glacier at 67 किमी (42 मील) rank as the world's second and third-longest glaciers outside the polar regions. Just to the west of the northwest end of the Karakoram, lies the Hindu Raj range, beyond which is the Hindu Kush range. The southern boundary of the Karakoram is formed by the Gilgit, Indus and Shyok rivers, which separate the range from the northwestern end of the Himalayas. The Patkai, or Purvanchal, are situated near India's eastern border with Burma. They were created by the same tectonic processes which led to the formation of the Himalayas. The physical features of the Patkai mountains are conical peaks, steep slopes and deep valleys. The Patkai ranges are not as rugged or tall as the Himalayas. There are three hill ranges that come under the Patkai: the Patkai–Bum, the Garo–Khasi–Jaintia and the Lushai hills. The Garo–Khasi range lies in Meghalaya. Mawsynram, a village near Cherrapunji lying on the windward side of these hills, has the distinction of being the wettest place in the world, receiving the highest annual rainfall. The Malwa Plateau is spread across Rajasthan, Madhya Pradesh and Gujarat. The average elevation of the Malwa plateau is 500 metres, and the landscape generally slopes towards the north. Most of the region is drained by the Chambal River and its tributaries; the western part is drained by the upper reaches of the Mahi River. Kutch Kathiawar plateau is located in Gujarat state. The Deccan Plateau is a large triangular plateau, bounded by the Vindhyas to the north and flanked by the Eastern and Western Ghats. The Deccan covers a total area of 1.9 million km² (735,000 mile²). It is mostly flat, with elevations ranging from 300 से 600 मी (980 से 1,970 फीट). The average elevation of the plateau is 2,000 फीट (610 मी) above sea level. The surface slopes from 3,000 फीट (910 मी) in the west to 1,500 फीट (460 मी) in the east. It slopes gently from west to east and gives rise to several peninsular rivers such as the Godavari, the Krishna, the Kaveri and the Mahanadi which drain into the Bay of Bengal. This region is mostly semi-arid as it lies on the leeward side of both Ghats. Much of the Deccan is covered by thorn scrub forest scattered with small regions of deciduous broadleaf forest. Climate in the Deccan ranges from hot summers to mild winters. The Chota Nagpur Plateau is situated in eastern India, covering much of Jharkhand and adjacent parts of Odisha, Bihar and Chhattisgarh. Its total area is approximately 65,000 किमी2 (25,000 वर्ग मील) and is made up of three smaller plateaus — the Ranchi, Hazaribagh, and Kodarma plateaus. The Ranchi plateau is the largest, with an average elevation of 700 मी (2,300 फीट). Much of the plateau is forested, covered by the Chota Nagpur dry deciduous forests. Vast reserves of metal ores and coal have been found in the Chota Nagpur plateau. The Kathiawar peninsula in western Gujarat is bounded by the Gulf of Kutch and the Gulf of Khambat. The natural vegetation in most of the peninsula is xeric scrub, part of the Northwestern thorn scrub forests ecoregion. The Satpura Range begins in eastern Gujarat near the Arabian Sea coast and runs east across Maharashtra, Madhya Pradesh and Chhattisgarh. It extends 900 किमी (560 मील) with many peaks rising above 1,000 मी (3,300 फीट). It is triangular in shape, with its apex at Ratnapuri and the two sides being parallel to the Tapti and Narmada rivers. It runs parallel to the Vindhya Range, which lies to the north, and these two east-west ranges divide the Indo–Gangetic plain from the Deccan Plateau located north of River Narmada. The Aravali Range is the oldest mountain range in India, running across Rajasthan from northeast to southwest direction, extending approximately 800 किमी (500 मील). The northern end of the range continues as isolated hills and rocky ridges into हरियाणा, ending near दिल्ली. The highest peak in this range is Guru Shikhar at Mount Abu, rising to 1,722 मी (5,650 फीट), lying near the border with Gujarat. The Aravali Range is the eroded stub of an ancient fold mountain system. The range rose in a Precambrian event called the Aravali–Delhi orogen. The range joins two of the ancient segments that make up the Indian craton, the Marwar segment to the northwest of the range, and the Bundelkhand segment to the southeast. 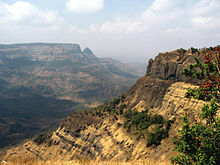 The Western Ghats or Sahyadri mountains run along the western edge of India's Deccan Plateau and separate it from a narrow coastal plain along the Arabian Sea. The range runs approximately 1,600 किमी (990 मील) from south of the Tapti River near the Gujarat–Maharashtra border and across Maharashtra, Goa, Karnataka, Kerala and Tamil Nadu to the southern tip of the Deccan peninsula. The average elevation is around 1,000 मी (3,300 फीट). Anai Mudi in the Anaimalai Hills 2,695 मी (8,842 फीट) in Kerala is the highest peak in the Western Ghats. The Eastern Ghats are a discontinuous range of mountains, which have been eroded and quadrisected by the four major rivers of southern India, the Godavari, Mahanadi, Krishna, and Kaveri. These mountains extend from West Bengal to Odisha, Andhra Pradesh and Tamil Nadu, along the coast and parallel to the Bay of Bengal. Though not as tall as the Western Ghats, some of its peaks are over 1,000 मी (3,300 फीट) in height. The Nilgiri hills in Tamil Nadu lies at the junction of the Eastern and Western Ghats. Arma Konda (1,680 मी (5,510 फीट)) in Andhra Pradesh is the tallest peak in Eastern Ghats. Many areas remain flooded during the heavy rains brought by monsoon in the Indian state of पच्छिम बंगाल. 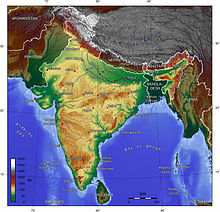 The Indo-Gangetic plains, also known as the Great Plains are large alluvial plains dominated by three main rivers, the Indus, Ganges, and Brahmaputra. They run parallel to the Himalayas, from जम्मू-काश्मीर in the west to आसाम in the east, and drain most of northern and eastern India. The plains encompass an area of 700,000 किमी2 (270,000 वर्ग मील). The major rivers in this region are the Ganges, Indus, and Brahmaputra along with their main tributaries–Yamuna, Chambal, Gomti, Ghaghara, Kosi, Sutlej, Ravi, Beas, Chenab, and Tista—as well as the rivers of the Ganges Delta, such as the Meghna. The Bhabar belt is adjacent to the foothills of the Himalayas and consists of boulders and pebbles which have been carried down by streams. As the porosity of this belt is very high, the streams flow underground. The Bhabar is generally narrow with its width varying between 6 से 15 किमी (3.7 से 9.3 मील). The Tarai belt lies south of the adjacent Bhabar region and is composed of newer alluvium. The underground streams reappear in this region. The region is excessively moist and thickly forested. It also receives heavy rainfall throughout the year and is populated with a variety of wildlife. The Bangar belt consists of older alluvium and forms the alluvial terrace of the flood plains. In the Gangetic plains, it has a low upland covered by laterite deposits. The Indo-Gangetic belt is the world's most extensive expanse of uninterrupted alluvium formed by the deposition of silt by the numerous rivers. The plains are flat making it conducive for irrigation through canals. The area is also rich in ground water sources.The plains are one of the world's most intensely farmed areas. The main crops grown are rice and wheat, which are grown in rotation. Other important crops grown in the region include maize, sugarcane and cotton. The Indo-Gangetic plains rank among the world's most densely populated areas. The Thar Desert (also known as the deserts) is by some calculations the world's seventh largest desert, by some others the tenth. It forms a significant portion of western India and covers an area of 200,000 से 238,700 किमी2 (77,200 से 92,200 वर्ग मील). The desert continues into Pakistan as the Cholistan Desert. Most of the Thar Desert is situated in राजस्थान, covering 61% of its geographic area. About 10 percent of this region comprises sand dunes, and the remaining 90 percent consist of craggy rock forms, compacted salt-lake bottoms, and interdunal and fixed dune areas. Annual temperatures can range from 0 °C (32 °F) in the winter to over 50 °C (122 °F) during the summer. Most of the rainfall received in this region is associated with the short July–September southwest monsoon that brings 100 से 500 मिमी (0.33 से 1.64 फीट) of precipitation. Water is scarce and occurs at great depths, ranging from 30 से 120 मीटर (98 से 394 फीट) below the ground level. Rainfall is precarious and erratic, ranging from below 120 मिमी (4.7 इंच) in the extreme west to 375 मिमी (14.8 इंच) eastward.The only river in this region is Luni. The soils of the arid region are generally sandy to sandy-loam in texture. The consistency and depth vary as per the topographical features. The low-lying loams are heavier may have a hard pan of clay, calcium carbonate or gypsum. In western India, the Kutch region in Gujarat and Koyna in Maharashtra are classified as a Zone IV region (high risk) for earthquakes. The Kutch city of Bhuj was the epicentre of the 2001 Gujarat earthquake, which claimed the lives of more than 1,337 people and injured 166,836 while destroying or damaging near a million homes. The 1993 Latur earthquake in Maharashtra killed 7,928 people and injured 30,000. Other areas have a moderate to low risk of an earthquake occurring. The Western Coastal Plain is a narrow strip of land sandwiched between the Western Ghats and the Arabian Sea, ranging from 50 से 100 किमी (31 से 62 मील) in width. It extends from Gujarat in the north and extends through Maharashtra, Goa, Karnataka, and Kerala. Numerous rivers and backwaters inundate the region. Mostly originating in the Western Ghats, the rivers are fast-flowing, usually perennial, and empty into estuaries. Major rivers flowing into the sea are the Tapi, Narmada, Mandovi and Zuari. Vegetation is mostly deciduous, but the Malabar Coast moist forests constitute a unique ecoregion. The Western Coastal Plain can be divided into two parts, the Konkan and the Malabar Coast. (The Lakshadweep and the Andaman and Nicobar Islands are India's two major island formations and are classified as union territories. (The Andaman and Nicobar Islands are located between 6° and 14° north latitude and 92° and 94° east longitude. They consist of 572 islands, lying in the Bay of Bengal near the Myanma coast running in a North-South axis for approximately 910 km. They are located 1,255 किमी (780 मील) from Kolkata (Calcutta) and 193 किमी (120 मील) from Cape Negrais in Burma. The territory consists of two island groups, the Andaman Islands and the Nicobar Islands. The Andaman and Nicobar Islands consist of 572 islands which run in a North-South axis for around 910 km. The Andaman group has 325 islands which cover an area of 6,170 km2 (2,382 sq mi) while the Nicobar group has only 247 islands with an area of 1,765 km2 (681 sq mi). India's only active volcano, Barren Island is situated here. It last erupted in 2017. The Narcondum is a dormant volcano and there is a mud volcano at Baratang. Indira Point, India's southernmost land point, is situated in the Nicobar islands at 6°45’10″N and 93°49’36″E, and lies just 189 किमी (117 मील) from the Indonesian island of Sumatra, to the southeast. The highest point is Mount Thullier at 642 मी (2,106 फीट). Other significant islands in India include Diu, a former Portuguese colony; Majuli, a river island of the Brahmaputra; Elephanta in Bombay Harbour; and Sriharikota, a barrier island in Andhra Pradesh. Salsette Island is India's most populous island on which the city of Mumbai (Bombay) is located. Forty-two islands in the Gulf of Kutch constitute the Marine National Park. The Himalayan river networks are snow-fed and have a perennial supply throughout the year. The other two river systems are dependent on the monsoons and shrink into rivulets during the dry season. The Himalayan rivers that flow westward into Punjab are the Indus, Jhelum, Chenab, Ravi, Beas, and Sutlej. National Highway 31A winds along the banks of the Teesta River near Kalimpong (पच्छिम बंगाल), in the Darjeeling Himalayan hill region. (The Ganges-Brahmaputra-Meghana system has the largest catchment area of about 1,600,000 किमी2 (620,000 वर्ग मील). The Ganges Basin alone has a catchment of about 1,100,000 किमी2 (420,000 वर्ग मील). The Ganges originates from the Gangotri Glacier in Uttarakhand. It flows southeast, draining into the Bay of Bengal). (The Yamuna and Gomti rivers also arise in the western Himalayas and join the Ganges in the plains. The Brahmaputra originates in Tibet, China, where it is known as the Yarlung Tsangpo River) (or "Tsangpo"). It enters India in the far-eastern state of अरुणाचल प्रदेश, then flows west through आसाम. The Brahmaputra merges with the Ganges in Bangladesh, where it is known as the Jamuna River. (The Western Ghats are the source of all Deccan rivers, which include the through Godavari River, Krishna River and Kaveri River, all draining into the Bay of Bengal. These rivers constitute 20% of India's total outflow). The heavy southwest monsoon rains cause the Brahmaputra and other rivers to distend their banks, often flooding surrounding areas. Though they provide rice paddy farmers with a largely dependable source of natural irrigation and fertilisation, such floods have killed thousands of people and tend to cause displacements of people in such areas. Major gulfs include the Gulf of Cambay, Gulf of Kutch, and the Gulf of Mannar. Straits include the Palk Strait, which separates India from Sri Lanka; the Ten Degree Channel, which separates the Andamans from the Nicobar Islands; 'and the Eight Degree Channel, which separates the Laccadive and Amindivi Islands from the Minicoy Island to the south. Important capes include the Kanyakumari (formerly called Cape Comorin), the southern tip of mainland India; Indira Point, the southernmost point in India (on Great Nicobar Island); Rama's Bridge, and Point Calimere. The Arabian Sea lies to the west of India, the Bay of Bengal and the Indian Ocean lie to the east and south, respectively. Smaller seas include the Laccadive Sea and the Andaman Sea. There are four coral reefs in India, located in the Andaman and Nicobar Islands, the Gulf of Mannar, Lakshadweep, and the Gulf of Kutch. Important lakes include Sambhar Lake, the country's largest saltwater lake in Rajasthan, Vembanad Lake in Kerala, Kolleru Lake in Andhra Pradesh, Loktak Lake in मणिपुर, Dal Lake in Kashmir, Chilka Lake(lagoon lake) in Orrisa, and Sasthamkotta Lake in Kerala. India's wetland ecosystem is widely distributed from the cold and arid located in the Ladakh region of Jammu and Kashmir, and those with the wet and humid climate of peninsular India. Most of the wetlands are directly or indirectly linked to river networks. The Indian government has identified a total of 71 wetlands for conservation and are part of sanctuaries and national parks. Mangrove forests are present all along the Indian coastline in sheltered estuaries, creeks, backwaters, salt marshes and mudflats. The mangrove area covers a total of 4,461 किमी2 (1,722 वर्ग मील), which comprises 7% of the world's total mangrove cover. Prominent mangrove covers are located in the Andaman and Nicobar Islands, the Sundarbans delta, the Gulf of Kutch and the deltas of the Mahanadi, Godavari and Krishna rivers. Parts of Maharashtra, Karnataka and Kerala also have large mangrove covers. The Sundarbans delta is home to the largest mangrove forest in the world. It lies at the mouth of the Ganges and spreads across areas of Bangladesh and West Bengal. The Sundarbans is a UNESCO World Heritage Site, but is identified separately as the Sundarbans (Bangladesh) and the Sundarbans National Park (India). The Sundarbans are intersected by a complex network of tidal waterways, mudflats and small islands of salt-tolerant mangrove forests. The area is known for its diverse fauna, being home to a large variety of species of birds, spotted deer, crocodiles and snakes. Its most famous inhabitant is the Bengal tiger. It is estimated that there are now 400 Bengal tigers and about 30,000 spotted deer in the area. The Rann of Kutch is a marshy region located in northwestern Gujarat and the bordering Sindh province of Pakistan. It occupies a total area of 27,900 किमी2 (10,800 वर्ग मील). The region was originally a part of the Arabian Sea. Geologic forces such as earthquakes resulted in the damming up of the region, turning it into a large saltwater lagoon. This area gradually filled with silt thus turning it into a seasonal salt marsh. During the monsoons, the area turn into a shallow marsh, often flooding to knee-depth. After the monsoons, the region turns dry and becomes parched. India’s Köppen climate classification map is based on native vegetation, temperature, precipitation and their seasonality. Based on the Köppen system, India hosts six major climatic subtypes, ranging from arid desert in the west, alpine tundra and glaciers in the north, and humid tropical regions supporting rainforests in the southwest and the island territories. The nation has four seasons: winter (January–February), summer (March–May), a monsoon (rainy) season (June–September) and a post-monsoon period (October–December)'. Summer lasts between March and June in most parts of India. Temperatures can exceed 40 °C (104 °F) during the day. The coastal regions exceed 30 °C (86 °F) coupled with high levels of humidity. In the Thar desert area temperatures can exceed 45 °C (113 °F). The rain-bearing monsoon clouds are attracted to the low-pressure system created by the Thar Desert. The southwest monsoon splits into two arms, the Bay of Bengal arm and the Arabian Sea arm. The Bay of Bengal arm moves northwards crossing northeast India in early June. The Arabian Sea arm moves northwards and deposits much of its rain on the windward side of Western Ghats. Winters in peninsula India see mild to warm days and cool nights. Further north the temperature is cooler. Temperatures in some parts of the Indian plains sometimes fall below freezing. Most of northern India is plagued by fog during this season. The highest temperature recorded in India was 51 °C (124 °F) in Phalodi, Rajasthan. The lowest was −45 °C (−49 °F) in Kashmir. India's geological features are classified based on their era of formation. The Precambrian formations of Cudappah and Vindhyan systems are spread out over the eastern and southern states. A small part of this period is spread over western and central India. The Paleozoic formations from the Cambrian, Ordovician, Silurian and Devonian system are found in the Western Himalaya region in Kashmir and Himachal Pradesh. The Mesozoic Deccan Traps formation is seen over most of the northern Deccan; they are believed to be the result of sub-aerial volcanic activity. The Trap soil is black in colour and conducive to agriculture. The Carboniferous system, Permian System and Triassic systems are seen in the western Himalayas. The Jurassic system is seen in the western Himalayas and Rajasthan. Tertiary imprints are seen in parts of Manipur, Nagaland, Arunachal Pradesh and along the Himalayan belt. The Cretaceous system is seen in central India in the Vindhyas and part of the Indo-Gangetic plains. The Gondowana system is seen in the Narmada River area in the Vindhyas and Satpuras. The Eocene system is seen in the western Himalayas and Assam. Oligocene formations are seen in Kutch and Assam. The Pleistocene system is found over central India. The Andaman and Nicobar Island are thought to have been formed in this era by volcanoes. The Himalayas were formed by the convergence and deformation of the Indo-Australian and Eurasian Plates. Their continued convergence raises the height of the Himalayas by 1 cm each year. Soils in India can be classified into 8 categories: alluvial, black, red, laterite, forest, arid & desert, saline & alkaline and peaty & organic soils. Alluvial soil constitute the largest soil group in India, constituting 80% of the total land surface. It is derived from the deposition of silt carried by rivers and are found in the Great Northern plains from Punjab to the Assam valley. Alluvial soil are generally fertile but they lack nitrogen and tend to be phosphoric. National Disaster Management Authority says that 60% of Indian landmass is prone to earthquake and 8% susceptible to cyclone risks. Black soil are well developed in the Deccan lava region of Maharashtra, Gujarat, and Madhya Pradesh. These contain high percentage of clay and are moisture retentive. Red soil are found in Tamil Nadu, Karnataka plateau, Andhra plateau, Chota Nagpur plateau and the Aravallis. These are deficient in nitrogen, phosphorus and humus. Laterite soils are formed in tropical regions with heavy rainfall. Heavy rainfall results in leaching out all soluble material of top layer of soil. These are generally found in Western ghats, Eastern ghats and hilly areas of northeastern states that receive heavy rainfall. Forest soils occur on the slopes of mountains and hills in Himalayas, Western Ghats and Eastern Ghats. These generally consist of large amounts of dead leaves and other organic matter called humus. Indian coal production is the 3rd highest in the world according to the 2008 Indian Ministry of Mines estimates. Shown above is a coal mine in झारखंड. India's total renewable water resources are estimated at 1,907.8 km3/year. Its annual supply of usable and replenshable groundwater amounts to 350 billion cubic metres. Only 35% of groundwater resources are being utilised. About 44 million tonnes of cargo is moved annually through the country's major rivers and waterways. Groundwater supplies 40% of water in India's irrigation canals. 56% of the land is arable and used for agriculture. Black soils are moisture-retentive and are preferred for dry farming and growing cotton, linseed, etc. Forest soils are used for tea and coffee plantations. Red soil have a wide diffusion of iron content. India is the world's biggest producer of mica blocks and mica splittings. India ranks second amongst the world's largest producers of barites and chromites. The Pleistocene system is rich in minerals. India is the third-largest coal producer in the world and ranks fourth in the production of iron ore. It is the fifth-largest producer of bauxite and crude steel, the seventh-largest of manganese ore and the eighth-largest of aluminium. India has significant sources of titanium ore, diamonds and limestone. India possesses 24% of the world's known and economically viable thorium, which is mined along shores of Kerala. Gold had been mined in the now-defunct Kolar Gold Fields in Karnataka. ↑ 4.0 4.1 Manorama Yearbook 2006 (India – The Country). मलयाला मनोरमा. 2006. प. 515. ISSN 0542-5778. ↑ "Territorial extent of India's waters". The International Law of the Sea and Indian MaritimeLegislation. 30 April 2005. ओरिजनल से 28 September 2007 के पुरालेखित. पहुँचतिथी 16 May 2006. ↑ 6.0 6.1 6.2 6.3 6.4 Manorama Yearbook 2006 (India – The Country). Malayala Manorama. 2006. प. 516. ISSN 0542-5778. ↑ Measurements are from recent imagery, generally supplemented with Russian 1:200,000 scale topographic mapping as well as Jerzy Wala, Orographical Sketch Map: Karakoram: Sheets 1 & 2, Swiss Foundation for Alpine Research, Zurich, 1990. ↑ "Physical divisions" (PDF). ओरिजनल (PDF) से 12 December 2004 के पुरालेखित. ↑ The Indian geographical journal. 46. Indian Geographical Society. 1971. प. 52. ↑ "The Deccan Plateau". How Stuff Works. पहुँचतिथी 14 November 2008. ↑ 11.0 11.1 11.2 11.3 11.4 11.5 11.6 11.7 11.8 11.9 Manorama Yearbook 2006 (India – The Country). प. 517. ↑ Aravali Range Students' Britannica India, by Dale Hoiberg, Indu Ramchandani. Published by Popular Prakashan, 2000. ISBN 0-85229-760-2. Page 92-93. ↑ Gupta, Harsh K; Aloka Parasher-Sen; Dorairajan Balasubramanian (2000). Deccan Heritage. Orient Blackswan. प. 28. ISBN 81-7371-285-9. ↑ Sharma, Hari Shanker (1987). Tropical geomorphology: a morphogenetic study of Rajasthan. Concept. प. 295. ISBN 81-7022-041-6. ↑ Pullaiah, Thammineni; D.Muralidhara Rao (2002). "Preface". Flora of Eastern Ghats: Hill ranges of south east India. 1. Daya Books. प. 1. ISBN 81-87498-49-8. ↑ Kenneth Pletcher (अगस्त 2010). The Geography of India: Sacred and Historic Places. The Rosen Publishing Group, 2010. प. 28. ISBN 978-16-1530-142-3. पहुँचतिथी 27 मार्च 2014. ↑ "The World's Largest Desert". geology.com. पहुँचतिथी 14 May 2011. ↑ "Thar Desert". Encyclopædia Britannica. पहुँचतिथी 14 May 2011. ↑ Kaul, R.N. (1970). Afforestation in Arid zones. N.V. Publishers, The Hague. ↑ "Preliminary Earthquake Report". USGS Earthquake Hazards Program. ओरिजनल से 20 November 2007 के पुरालेखित. पहुँचतिथी 21 November 2007. ↑ Brijesh Gulati (January 2006). "Earthquake Risk Assessment of Buildings: Applicability of HAZUS in Dehradun, India" (PDF). Indian Institute of Remote Sensing, National Remote Sensing Agency. ओरिजनल (PDF) से 28 May 2008 के पुरालेखित. पहुँचतिथी 19 November 2008. ↑ Manorama Yearbook 2006 (India – The Country). प. 519. ↑ "The Eastern Coastal Plain". Rainwaterharvesting.org. पहुँचतिथी 19 November 2008. ↑ 25.0 25.1 "National Portal of India: Know India: State of UTs". Government of India. ओरिजनल से 19 जून 2010 के पुरालेखित. पहुँचतिथी 19 November 2008. ↑ Majuli, River Island. "Largest river island". Guinness World Records. पहुँचतिथी 6 September 2016. ↑ 27.0 27.1 "Introduction to Inland Water Transport". Government of India. ओरिजनल से 9 July 2012 के पुरालेखित. पहुँचतिथी 19 November 2008. ↑ 28.0 28.1 28.2 28.3 Manorama Yearbook 2006 (India – The Country). प. 518. ↑ Elhance, Arun P. (1999). Hydropolitics in the Third World: conflict and cooperation in international river basins. US Institute of Peace Press. पप. 156–158. ISBN 978-1-878379-91-7. पहुँचतिथी 24 April 2011. ↑ 31.0 31.1 Manorama Yearbook 2006 (India – Environment). प. 580. ↑ World Wildlife Fund (2001). "Rann of Kutch". WildWorld Ecoregion Profile. National Geographic Society. ओरिजनल से 2010-03-08 के पुरालेखित. पहुँचतिथी 19 November 2008. ↑ 36.0 36.1 36.2 36.3 36.4 36.5 36.6 Manorama Yearbook 2006 (India – Geology). प. 521. ↑ "India Agronet – Soil Management". Indiagronet.com. पहुँचतिथी 18 July 2007. ↑ 38.0 38.1 38.2 38.3 38.4 38.5 "Fertilizer use by crop in India". U.S. Food and Agriculture Organization. पहुँचतिथी 2 अगस्त 2007. ↑ 39.0 39.1 39.2 39.3 "Krishi World website". Krishiworld.com. ओरिजनल से 9 जून 2007 के पुरालेखित. पहुँचतिथी 18 July 2007. ↑ "Water profile of India". Encyclopedia of Earth. पहुँचतिथी 20 November 2008. ↑ 41.0 41.1 Jain, J.K.; Farmer, B. H.; Rush, H.; West, H. W.; Allan, J. A.; Dasgupta, B.; Boon, W. H. (May 1977). "India's Underground Water Resources". Philosophical Transactions of the Royal Society of London. 278 (962): 507–22. doi:10.1098/rstb.1977.0058. ↑ 42.0 42.1 42.2 "Energy profile of India". Encyclopedia of Earth. पहुँचतिथी 20 November 2008. ↑ Chandrasekharam, D. "Geothermal Energy Resources of India". Indian Institute of Technology Bombay. ओरिजनल से 17 December 2008 के पुरालेखित. पहुँचतिथी 2 November 2008. ↑ 44.0 44.1 44.2 44.3 "India's Contribution to the World's Mineral Production". Ministry of Mines, Government of India. पहुँचतिथी 20 November 2008. ↑ "India". CIA Factbook. पहुँचतिथी 16 जून 2007. ↑ "Information and Issue Briefs – Thorium". World Nuclear Association. ओरिजनल से 7 November 2006 के पुरालेखित. पहुँचतिथी 1 जून 2006. ↑ "Death of the Kolar Gold Fields". Rediff.com. पहुँचतिथी 21 November 2008.